Before we leave this house I wanted to share one of my favorite things. We redecorated the boys room soon after we moved in. I got this idea from a family in Utah who remodeled their home and added crown molding and 1x4 plywood to the top of each of their door frames. I loved how it made a little shelf at the top of each door where they could display little items. I decided I wanted to use the same idea but make it a floating shelf and use a 1x6 so I could display larger accessories. Measure how high you want the shelf and mark it. We put the shelf at 74 inches from the floor. I think it is perfect height. It is high enough that the kids can't reach it, you won't hit your head on it, and you can't see the dust... perfect! I just used painters tape to mark the height on the 2 walls we were putting the shelves on. (if you use a larger molding you may be able to skip that step). Hold the 3 pieces against the wall and make sure they fit before you screw anything in. We had to keep shaving more off the 2x2 before it would fit just right. Now, find the studs and screw the 2x2 plywood into the studs so you know the shelf will hold. We trimmed off the corners of the 1x6 where it came to the window so it wasn't this big corner sticking out. Now, attach the 1x6 by screwing it down from the top into the 2x2. 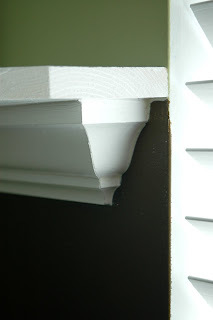 Finally, attach the crown molding with finishing nails into the wall at the base and the 2x2 piece at the top. Caulk the corners and edges and you're done! What a difference this little shelf makes. I love how I can have the cutesy stuff in the room but the kids can't get at it and it doesn't take up any needed space (you can only put so many things on top of a dresser my friends). I especially love that it draws the eyes up (away from the mess on the floor) and you can't see the dust! Does it get better than that?! PPS or is it PSS I won ANOTHER giveaway here. WAHOO! I haven't gotten it yet but I am excited. Beautiful! I wanted to add a shelf in my daughter's room, but didn't really know how. Thank-you for the tutorial! I can see these being in every room of our home! I have always loved that shelf!! we did one similar in Kari's room when she was a toddler... She called it the "high shelf"... when she would get fancy dolls (the not to play with kind) she would call them her "high shelf toys"... After we moved she kept asking for her "high shelf" back... we never did build another one... but I keep meaning to! Congrats on selling your house!! So sad to see you guys go, but I'm glad to hear that hopefully everything will go smoothly for you!! Thanks so much! 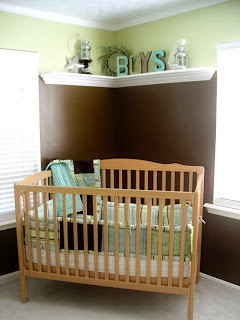 The original post of this room was what hooked me on this blog. I love it! Keep up the good work. 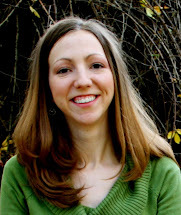 I just recently discovered your blog! I love it! 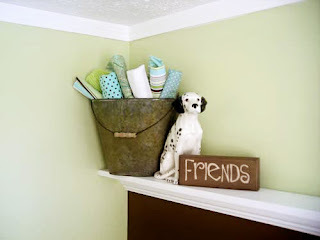 Thanks for sharing the how to on these cute shelves! My hubby is in Medical School right now...it's comforting to see people buy houses in residency...it gives me hope to one day own one! Haha! All of the rooms in your house are so cute!!! 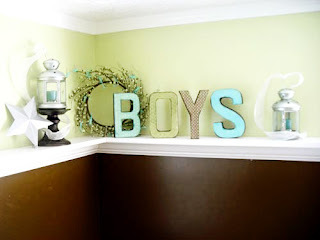 I absolutely love the boys room and the playroom!!! Awesome! Thanks for sharing. I can't wait to own a house so we can do something like this. So simple, but great impact. Shut-up!! Another giveaway??? Tell me your secrets (probably enter now and again:)) Can't wait to come babysit and craft while you are house hunting!! I am in LOVE with this idea. I featured it here on myh blog http://oopsey-daisy.blogspot.com/2010/03/wednesdays-wowzers-what-im-lovin.html. 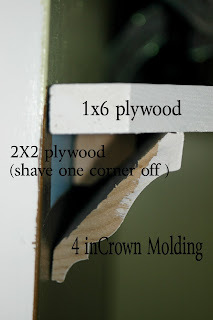 How did you "shave" the corner off of the 2 x 2 plywood? Do you need a special saw? I am doing this in one of our rooms soon! I am definitely going to do this!! Thanks for the tutorial!! 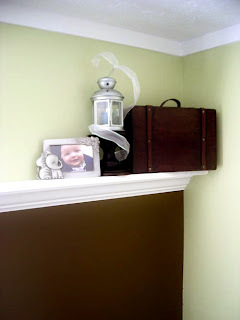 I LOVE these kind of shelves, super practicle and ideal when having small children as well. Ikea has some nice wall type shelves as well, that we've bought in the past. LOVE it!! & just what I need for my playroom. Is the shopping list what you need for ONE shelf? Thanks for this perfect idea because I had always paid for those shelfs now I got good tips in order to make my own shelfs in an easy way.